May 2015 has brought record to near-record rainfall in much of the deep southern United States. 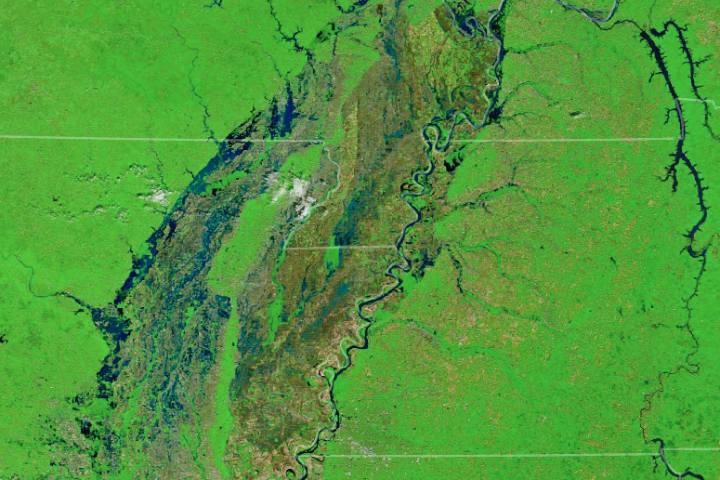 That water has filled lakes, streams, and rivers to the brim, and several have flooded, leading to property losses and evacuations in Arkansas, Texas, and Oklahoma. At least eight people have died and twelve have been reported missing, according to news reports. 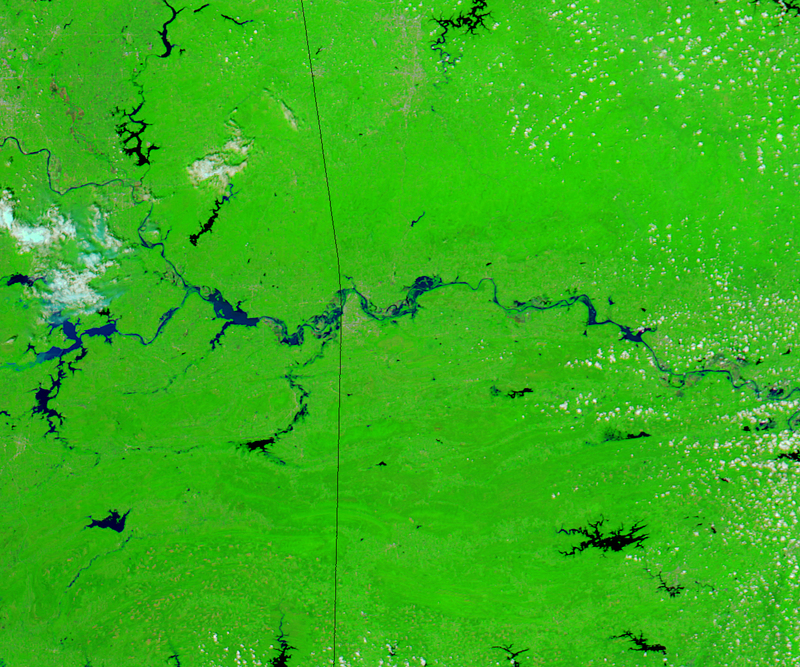 The two false-color satellite images above show the Arkansas River as it runs through Oklahoma and Arkansas. 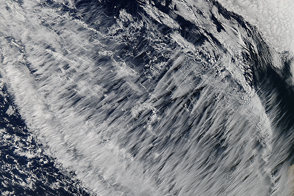 The top image was acquired on May 26, 2015, by the Moderate Resolution Imaging Spectroradiometer (MODIS) on NASA’sAqua satellite. 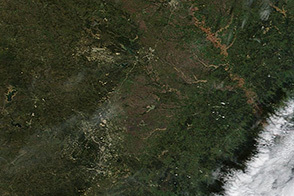 For comparison, the lower image shows the same area under more typical conditions as observed by MODIS on the Terra satellite on May 14, 2013. 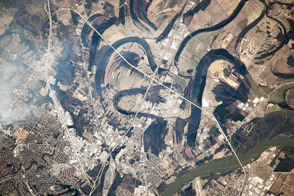 The Arkansas River is the second-longest tributary of the Mississippi River, flowing from Colorado down through Kansas, Oklahoma, and Arkansas. 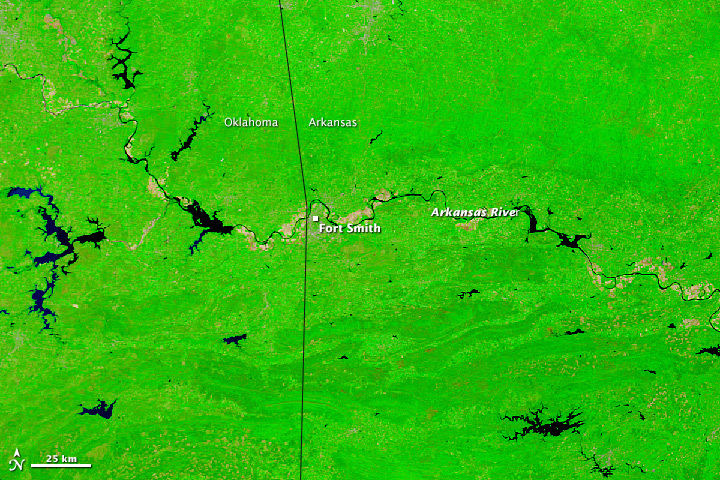 On May 26, the river reached 33.39 feet (10.18 meters) at the Van Buren gauge near Fort Smith. Flood stage at that area is 22 feet; above 31 feet is considered a major flood. 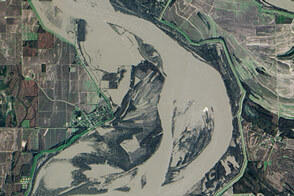 Waters appeared to crest in the evening on May 26 and began to subside, but more rain was predicted for the watershed in the final days of May. 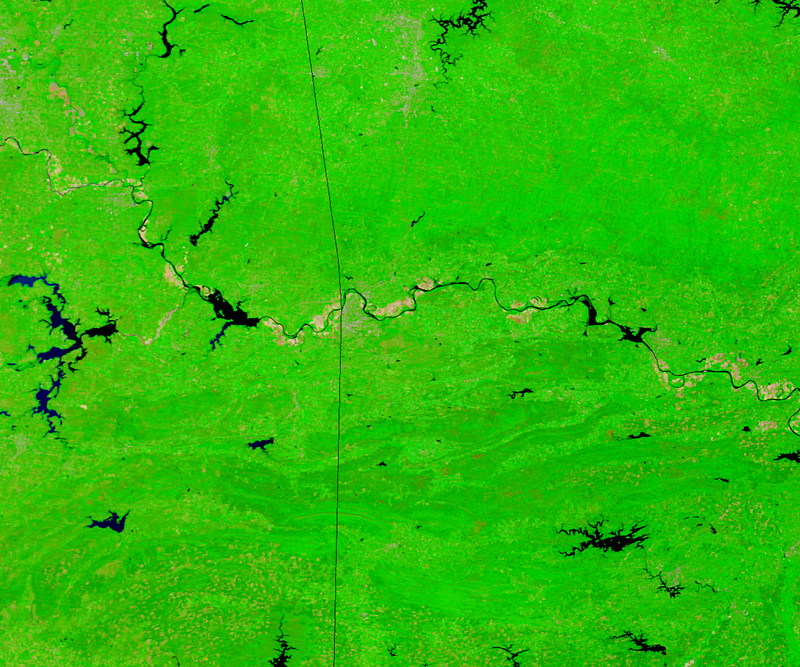 Fort Smith, the second largest city in Arkansas, sits along that river and was drenched with 18.33 inches (465.58 millimeters) of rain from May 1–26. The previous May rainfall record was 13.67 inches (347.22 mm); the previous high rainfall for any month was 15.02 inches (381.51 mm) in June 1945. The U.S. Army Corps of Engineers has closed four of Arkansas’ five navigable rivers to commercial and recreation traffic due to the flooding. Federal and state authorities in the region have been trying to manage the outflow from lakes and reservoirs, as well as river flow. 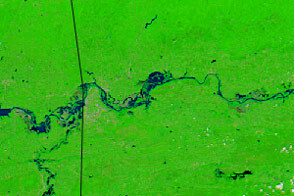 Gauges monitored by the NOAA Advanced Hydrological Prediction Service also reported major flooding on the Red River (Texas-Oklahoma border) and on the Washita River in Oklahoma. Flood watches and warnings were in effect in much of the three states. 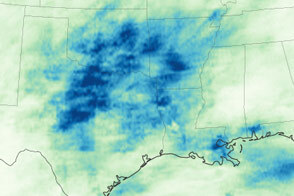 Rain and flood conditions have been as bad or worse in much of Oklahoma and Texas, but persistent cloud cover has prevented a clear satellite view since early May. Meteorologists are beginning to see connections between the rain in southern North America and the developing El Niño in the eastern Pacific. 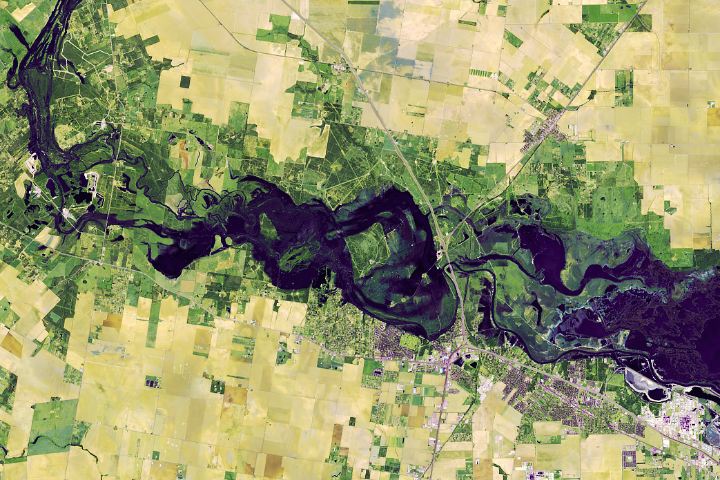 NASA images by Jeff Schmaltz, LANCE/EOSDIS Rapid Response. Caption by Mike Carlowicz. 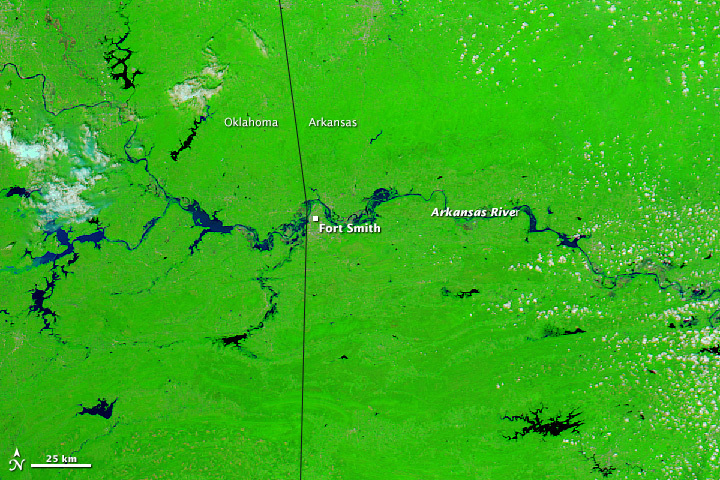 Record-setting rain has sent rivers over the banks in Arkansas, Oklahoma, and Texas. Record rainfall sent many rivers over the banks and led to extensive damage in Texas, Oklahoma, Arkansas, and other southern plains states. Advanced Hydrological Prediction Service (2015) Tulsa AHPS Hydrograph Monitor. Accessed May 27, 2015. 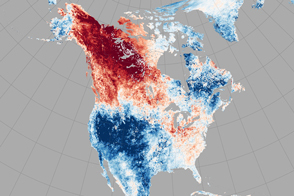 NASA Earth Observatory (2015, May 22) Drenching the South and Plains. NOAA ENSO Blog (2015, May 14) Will this ENSO be an overachiever, or peaked in high school? Accessed May 27, 2015. The Times Record (2015, May 27) Weather Woes Bring Traffic to Standstill on Arkansas Rivers. Accessed May 27, 2015. The Times Record (2015, May 27) Flooding Again Hits Western Arkansas, Northeast Oklahoma. Accessed May 27, 2015. WunderBlog at Weather Underground (2015, May 26) Epic Rains, Disastrous Floods Plague Texas, Oklahoma. Accessed May 27, 2015.